The General Manager of the Haryana State Federation of Consumers’ Cooperative Wholesale stores Ltd (Confed), Sector 2, Panchkula, committed suicide by hanging himself from a ceiling fan at his residence in Sector 20, Panchkula, late this evening. Two employees of Hotel Park Plaza in Sector 17 were killed while another was injured after the motorcycle they were riding was hit by a truck. Five trains reaching the Chandigarh railway station were delayed due to fog in Saharanpur in Uttar Pradesh on Sunday morning. Onion prices continue to remain volatile with the rates shooting up again to Rs 100 a kg level in retail markets in the city. Tomatoes are also being sold at Rs 90 a kg, forcing residents across the Tricity to rush to Apni Mandi and the Sector 26 grain market to get some rebate. 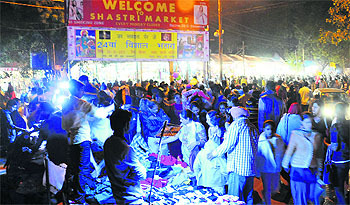 The prices of onions, tomatoes and potatoes were low at the Apni Mandi in Sector 34 as compared to the retail market. In a relief to the Army personnel and ex-servicemen, the Haryana government has exempted them from paying property. Encroachments in corridors of the city markets have become a major problem with the municipal corporation (MC) turning a blind-eye to them. Goods and grocery items that are displayed by shopkeepers in front of their shops hardly leave any space for the visitors. The last day of the Chandigarh Literature Fest at Hotel Taj was rich in audience and literary conversation. The highlight of the day was the conversation on Mumbai based writer-critic Jerry Pinto’s debut novel “Em and the big Hoom,” a story of a mentally unstable mother (Em), seen from the eyes of his growing son. Empathising with the commuters, who are a harried lot, has never been of any concern to the CTU bosses. Politicians change colours like chameleon. Once at loggerheads with UT Chief Architect Sumit Kaur, former Mayor and councillor Pardeep Chhabra was all praise for her during the inauguration of the Sector 17 overbridge. Following the failure of the Jan Aushadhi Centre at the PGI in providing medicines to patients at cheaper rates, the institute had shot off a letter to the Ministry of Drugs and Chemical Fertilisers. 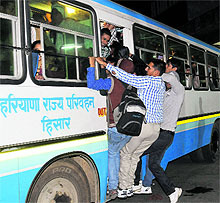 It was long wait for around 300 passengers at the Inter-state Bus Terminal in Sector 17. For six hours, they did not get a bus to Hisar. Hundreds of students had come to the city from Haryana to take the Staff Selection Commission exam, which was held in two shifts from10 am to 12 pm and 2 pm to 4 pm. The post-mortem of a 22-year-old woman revealed that she might have died of epilepsy as seizures were found in her brain. Come December and weather may play havoc with your travel plans. The instrument landing system (ILS) at the Chandigarh domestic airport is yet to be upgraded. 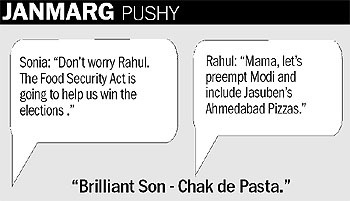 Candidates contesting the Lok Sabha elections should campaign through social media. A family of Class III employee of MC Zoological Park, Chhatbir, has claimed having spendsleepless nights due to snake scare. A seven-year-old Asian elephant male calf named Rajveer died all of a sudden today in the morning at MC Zoological Park, Chhatbir. Zirakpur, November 10 A man, who was seriously injured in an accident at Zirakpur, succumbed to his injuries in PGI Chandigarh on Sunday. The Federation of Sector Welfare Association (FOSWAC) held an executive committee meeting at the Community Centre of Modern Housing Complex, Mani Majra, today. The third and the last day of PECFest 2013 couldn’t have been better, with scores of people from different colleges coming to take part in the various events and competitions. The police has arrested five persons on the charges of illegal mining. The police seized sand loaded trucks near Banur on Sunday. Sand was loaded from Ghaggar river illegally. A security guard employed at Indian bank, Dera Bassi, was murdered last night. He was attacked with knifes and iron rods. The HTCPA in collaboration with the Harpal Tiwana Foundation will hold a special Sufi evening to mark the 2nd Anniversary of the Harpal Tiwana Centre for Performing Arts tomorrow. The police today arrested Gurwinder Singh on a charge of selling psychotropic drugs. It recovered 125 capsules from his possession. A car with a blue beacon atop was also impounded. The police arrested a drug peddler and recovered 60 kg of poppy husk from his possession today. Sri Guru Gobind Singh College (SGGS), Sector 26, defeated Principal Accountant General (Audit) Haryana (AG Haryana) in the final of Institutional League Football Championship. Local shooter Harjot Singh won laurels by winning a gold medal in the 25-metre event during the 23rd All India GV Mavalankar Shooting championship, concluded in West Bengal today. Chandigarh Police DSP Ashish Kapoor continued his winning streak and claimed the title of open singles during the concluding day of 14th All-India Police Lawn Tennis Championship, held at CLTA courts, Sector 10, here today. The fencers of Post Graduate Government College for Girls, Sector 11, won the title of Panjab University Inter-College Fencing Championship for Women while the men’s fencing team of SGGS College, Sector 26, won the Panjab University Inter -College Fencing Championship for Men, for the sixth time, concluded at the Gymnasium Hall of Panjab University. 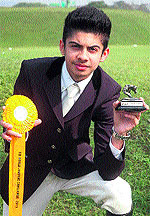 Local equestrian prodigy Zoravar Singh Thiara is all set to compete at Youth Olympics 2014, to be held in China next year. After a good show at FEI World Show Jumping Challenge, conducted at the Army Riding and Polo Club, Delhi from October 28 to 31, Zoravar is ready to perform at an international event. In FEI challenge- qualifier for the Youth Olympics 2014 - Zoravar has competed in the highest category in Category-A, comprised of jumps of 1.20 meter and a course with a high level of difficulty. The cricket team of Guru Nanak Public School, Sector 36, will face the Satluj Stunners in the finals of 2nd Satluj Premier League cricket tournament for boys (U-15), here. In the semi-finals played at Satluj Pubic School, both the teams defeated their respective rivals. Guru Nanak Public School beat St. Soldier’s School, Sector 28, by 4-wickets while the Satluj Stunners defeated their counterpart Satluj Blue in super over. The cricket team of Max hospital XI defeated Kudos Chemie in a match of ongoing 4th AG corporate T-20 cricket tournament, being held here today.